No, your eyes don’t deceive you. You're looking at a convertible Subaru Impreza for sale. The Subaru Impreza has been offered in many guises since launching in the 1990s, including a four and five-door sedan, coupe, hatchback and even a wagon. To date, Subaru has never offered a convertible version as part of the official Impreza line-up, and neither does it plan to as far as we’re aware. So you can imagine our confusion when this convertible 2011 Subaru Impreza WRX was spotted for sale at a dealership in Manchester, North Hampshire. For once, this isn’t a render mock-up by an ambitious artist – this is the real deal. Ironically, the listing fails to mention the car’s rather unique attribute. “Experience driving perfection in the 2011 Subaru Impreza WRX!” it reads. “With less than 10,000 miles on the odometer, this four-door sedan prioritises comfort, safety and convenience,” it continues. “Subaru made sure to keep road-handling and sportiness at the top of its priority list.” You would think they were advertising a perfectly stock, unaltered Impreza WRX. A close-up shot of the wheels also reveals that the car for sale is a souped-up STI model, rather than a standard WRX. According to a builder’s plaque on the car, the conversion was carried out by Newport Specialty Cars in Placentia, California, back in January 2011. They’ve done a commendable job at making the Impreza cabrio seem authentic, retaining the original B-pillars with an additional connecting brace for extra rigidity, while the added soft top blends with the Impreza's shape surprisingly well. It’s also only clocked up 9,042 miles on the odometer. 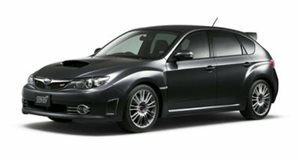 If, for some reason, you’ve always dreamt of owning a convertible Impreza WRX STI, the Manchester Subaru dealer is asking for $26,967, which isn’t outrageous considering there are no other rally-inspired convertibles on the market.